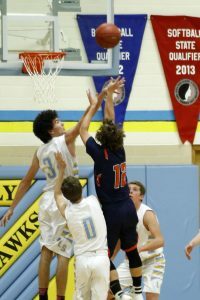 The Lynnville-Sully boys basketball team took the floor against the Colfax-Mingo Tigerhawks on Tuesday, Dec. 5. 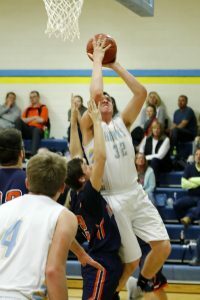 The Tigerhawks returned nearly every player from last season’s team and proved to be a tough opponent for the Hawks. L-S started off strong in the first half but was tripped up a bit in the third quarter when the Tigerhawks switched up their defenses. The changes were not enough to defeat the Hawks, though, as they went on to win 52-39. “The guys worked hard defensively to hold them to 11 points in the first half. Offensively, we had a dry spell in the second half, which allowed them back into the game,” said L-S Head Coach Nick Harthoorn. The Hawks were led in scoring by senior Jesse Van Wyk with 17 points. 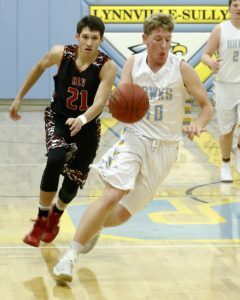 Fellow senior Brevin Hansen followed Van Wyk with 14 points. Senior Tanner Foster and junior Rylan James each contributed nine points. Junior Rylan James powers up for two points against Colfax-Mingo. James put up nine points against the Tigerhawks and also had three rebounds and two assists as well as a steal. The Hawks had a good night defensively, forcing 14 turnovers and grabbing a total of 36 rebounds. The Hawks were led in the steal category by Hansen with five, and Van Wyk swiped two. Van Wyk grabbed 13 rebounds on the night to lead the Hawks. He was followed by seniors Drake Ehresman, Corey McCoy, and Foster with four apiece. The Tigerhawks were led by senior Jarod Nichols with 17 points and 13 rebounds. With the loss, the Tiger-hawks fell to 1-2 on the season. This was the first game of a two-game week for the Hawks as they also played HLV on Friday. A few nights later on Friday, Dec. 8, the L-S boys had an easier night on the court while hosting the HLV Warriors. The Hawks cruised to a 86-35 victory. They were able to force turnovers and get easy baskets early and often and never looked back. “We did a much better job moving the basketball tonight, and it showed in the assist column and on the scoreboard. The guys were active defensively and on the boards. It was fun to watch everyone get involved and play hard,” said L-S Coach Harthoorn. Senior Kemper Lukehart crosses half-court ahead of his HLV opponent as he brings the ball up court for L-S. The Hawks dominated HLV, 86-35, and Lukehart finished with three points from a three-pointer. The Hawks were able to get easy layups to start the game off by using great ball movement and screens to score easy points. They racked up 32 points in the first quarter, while forcing the Warriors to commit eight turnovers. In the second quarter, the Hawks kept the pressure up and scored 22 more points, holding the Warriors to 10. In addition to forcing four more turnovers in the second quarter, a major difference in the first half was the Hawks were able to get offensive rebounds and second- chance points. Going into halftime, the Hawks led 54-22. “Defensively, we were able to force turnovers and show our true potential. When we move the ball and play defense, we are one of the best teams in the state. Losing to East Marshall taught us to play as a team,” said senior Drake Ehresman. Coming out of halftime, the pace slowed, but L-S still scored 32 points in the second half, while forcing the Warriors to commit 12 second-half turnovers. The Hawks were only forced to 10 total turnovers the whole game. “It was fun being able to get all of the guys in this game. The fun games are the games when all of the guys are able to contribute to the game. All of the players on our team have something they can help with,” said senior Tanner Foster. The leading scorer for the Hawks was Van Wyk with 16 points followed by senior Brevin Hansen and Foster with 13. The leading rebounder for the Hawks was junior Rylan James, bringing down eight rebounds and adding a team-high three blocks. Foster and Van Wyk each had five assists, leading the team. Senior Corey Mc-Coy (#34) gets a hand in a Colfax-Mingo shot. Team-mates surrounding him are fellow seniors Brevin Hansen (#0) and Jesse Van Wyk. L-S won the game 52-39.